While not glamorous or something people tend to consider when going off the grid, it none the less is important and can majorly impact your wallet and success of your project if not considered up front. 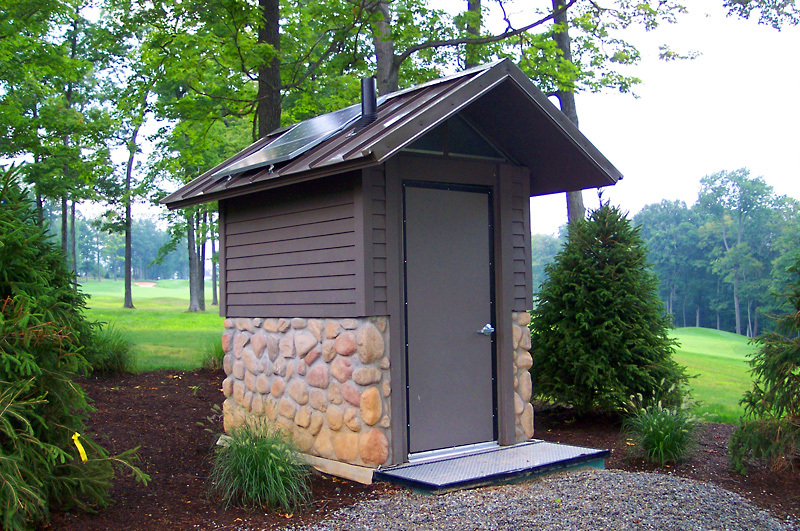 With that in mind we covered everything from ways to handle normal household trash to waste water; namely means to handle gray water, the compost toilet option, and finally a primer on septic systems and there maintenance needs. So before moving onto our next topic of Water, we thought a brief recap on the issues would be in order. Along the same lines let’s also look at how these choices impact other items & my thoughts on the ideal setup. What more can we really add – the more you reduce, reuse, & recycle the trash coming in, the less you will need to deal with. If you have garbage service to your property, then the impacts are generally pretty minimal for you and generally revolve only around the cost, temporary storage, & local wildlife getting to it. If one decides to use a trash compactor, how often will it be used, how much power the unit requires as this will impact our electric sizing needs and the kitchen or pantry layout. Composting food & other “clean” waste products – what & where do we place the very short term storage container, where will the pile be, are there any environmental or wildlife concerns? 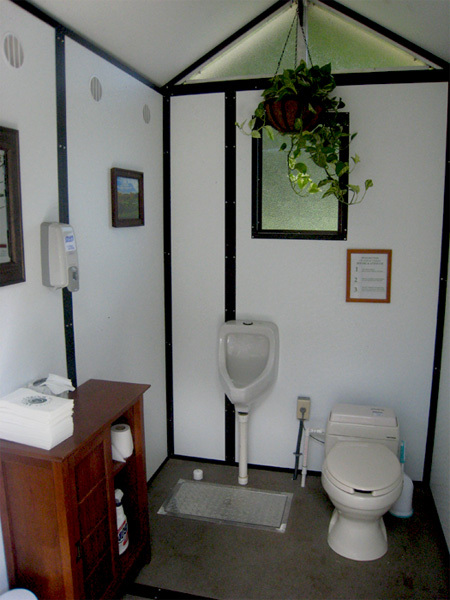 Once again, I really have to thank Allison for doing that guest article on composting toilets. As I mentioned, while I have installed them, I never knew what maintenance was really involved & what it was like living with one. In further researching the issue, I think one should be forewarned as some units can be maintenance intensive as Tad Montgomery & Associates point out in this piece on two common systems. The one I installed was very similar to the systems they talk about as it had a powder that was supposed to be mixed with water and added once a week along with 20+ bags of “bulking” agent for approx. 1 year’s usage. Power usage: You may also want to watch closely how much power a unit requires. As noted in the piece above, one unit actually required 550 watts of power, whereas a separate review of the Phoenix system by Tad Montgomery & Associates only required 5 watts of power. That is a pretty big difference one is faced with actually sizing your electrical & backup power needs. Waste Water: Whether it is waterless, foam-flushed, or maybe even uses water, herein lays another important factor to consider. The unit I installed simply had a tube for any waste water to be discharged into a leaching field where higher end units might have a built in evaporation system &/or storage system. You also need to be careful on your sizing, especially if you plan on having the entire clan over for the Holidays. 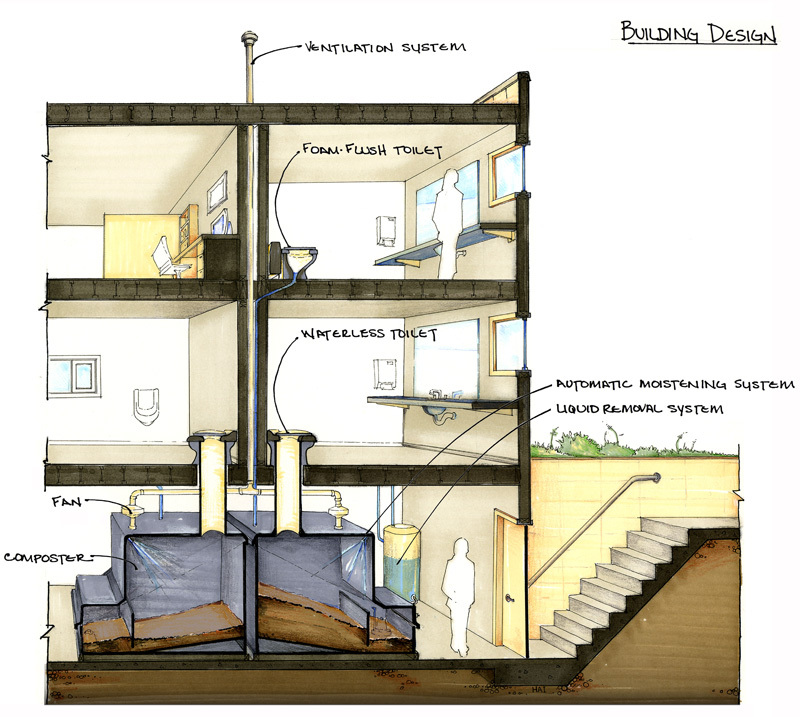 One other factor is location in the house & how you will run the plumbing for it. Not only do most units recommend that they be located in area that stays at 75° it can be an interesting challenge retrofitting one in a finished space. 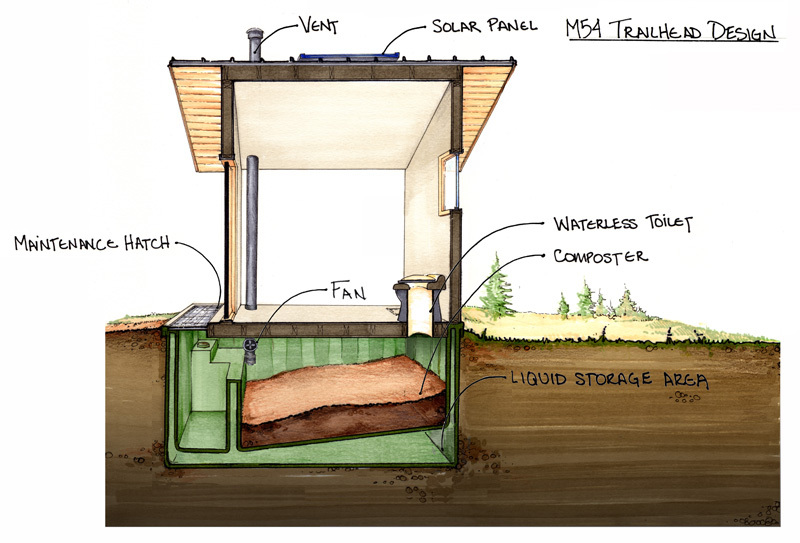 For more info, MTU has compiled a great list of links about composting. If you do utilize a composting system, you will definitely have to consider how you will handle the grey water issue (Showers, Sinks, Laundry). As a reminder, grey water should not be stored in tanks & needs to be used within a day. If it isn’t, it essentially becomes black-water as all the oxygen in the water is used up & it starts to smell. This is mainly due to a higher level of organic material that hasn’t been processed via our digestive system and decomposes much faster. While there are filtering systems available to help handle this issue, this requires a lot of equipment and maintenance. Let’s be fully honest here, I don’t care if you are connected to a septic, sewer, compost or grey water system, once you dump a toxic substance in it, you have created an issue. Septic systems do not pollute by themselves & when designed properly will do just as good if not a better for some homeowners than the other two systems listed above. In many ways the issues are almost identical – sizing, piping, location, drainage, perc rates, what goes down the drain, etc… Considering these items up front might result in you choosing another location for your house, or possibly knowing that you will have an increased electrical load required for filtration, pumps &/or a maceration unit. 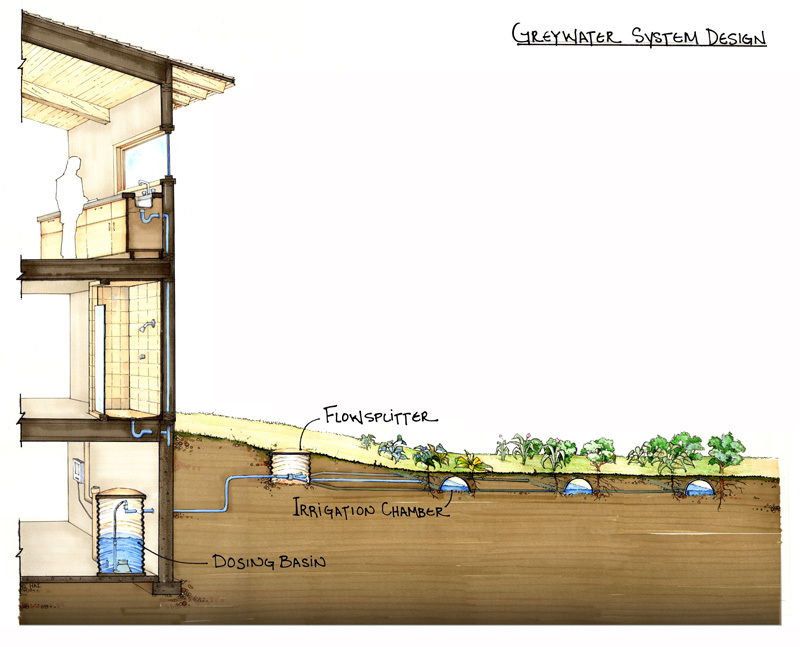 If I was designing my house, I would lean very strongly towards possibly having a distributed gray water system fed from the washing machine for watering any trees, shrubs or flower gardens I might have. The rest of the water from the showers, sinks & toilets would ultimately go to a septic system which is better set to handle any hair, oils, baking grease or food that may make it into the system. I would also look at making sure gravity worked for me as the last issue you want is having a power issue that may affect your being able to flush or having it back up & overflowing a temporary storage tank.